Sometimes gadget-makers just don't have the right idea, as this list awful products at this year's Consumer Electronics Show proves. 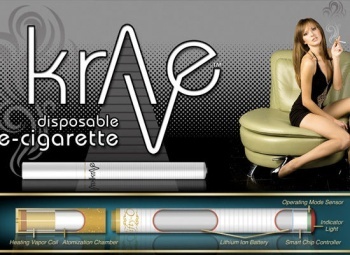 Krave displayed a disposable electronic cigarette that injects water vapor laced with nicotine into your lungs when it is puffed on. I mean, the Krave gets points for trying to make a less death-inducing cigarette. It loses points for its creators believing that anyone would actually buy this product. Ear buds that vibrate in your ear. I don't know about you, but one of the most annoying sensations I can think of is buzzing in my ear. It makes me think of mosquito bites and hangovers. A full-sized QWERTY keyboard for your iPhone. One wonders if its makers ever owned a laptop. Because if you're going to be carrying around something that big, you might as well have a full-featured computer instead of a handheld. Just saying. Worst product name ever. Phone + Cubby = stupid. There is absolutely no reason anyone would need/want to wear their phone on their wrist. Especially if they couldn't see through the cute fuzzy fabric holding the phone. Phubby phail. Because Teddy Ruxpin wasn't creepy enough for some people, now you can have an animatronic animal dance and sing to your favorite songs.